Femtolasik 6D is the most widely used surgical method in the world today - as of 2009, nearly 30 million people have enjoyed its benefits. It’s also recommended by the US Military to decrease their troops’ reliance on corrective eyewear - 224,000 US military personnel have undergone the surgery as at 2008. They have reported that 100 percent of pilots and other aircraft personnel from the U.S. Navy and U.S. Marine Corps who underwent custom Wavefront-guided Femtolasik 6D attained 20/20 uncorrected visual acuity within two weeks after surgery. With Oftum’s extensive surgical experience, our use of the finest equipment available and our commitment to the “bladeless” surgical method, you can be sure that we will give you the very best that the femtolasik 6D procedure has to offer - and our quality guarantee gives you all the peace of mind possible! 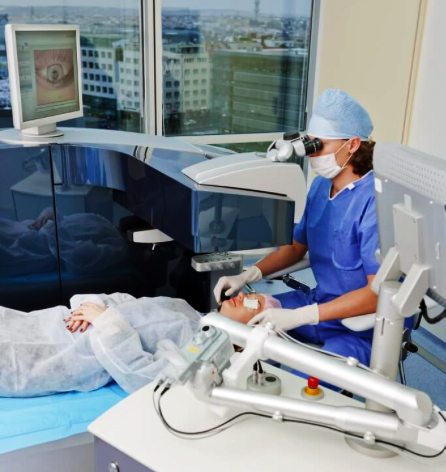 LASIK is a two stage surgical procedure. At Oftum, we’re committed to doing this with the all-laser method so that your procedure and post-operative period is as safe and comfortable as possible. In order to expose the cornea, a flap of 0.1mm thickness is created using a special Femtosecond Laser. OFTUM is proud to note that we adopted this “bladeless” technology 10 years ago, abandoning the old bladed method. We took this decision as part of our overall commitment to patient safety and consequently we are among the most experienced Femtosecond Surgeons in the world. The Femtosecond Laser is attached and fixed by a slight vacuum to your cornea, and after a few seconds, at a precisely calculated depth into your cornea, it places micro laser pulses which separate the collagen layers from each other - thereby creating a corneal lamella - the flap. The Femtosecond Laser operates in complete darkness and you do not feel or see anything. You’ll hear a countdown of the time remaining until this stage is complete and after approximately 20 seconds, the flap is complete. After the vacuum is released, the flap is flipped sideways and the Excimer Laser reshapes your exposed cornea. The flap is then replaced and due to the extremely fine edges created by the Femtosecond Laser it is healed back to its original location within 1-2 hours. Due to this procedure and its extremely quick post-operative healing, your vision is immediately focused and there is no post-operative pain. Immediately after your procedure - RELAX! Ideally just rest, sleep, and maintain your schedule of eye drops. If you’re going out, use the high quality branded sunglasses we’ve given you. We will see you on the following day for the removal of your therapeutic contact lens and to check on the results of your surgery. After that, just maintain your schedule of eye drops for the following month, and enjoy your new view of the world! After that, though, we’re still with you - you’ll be in direct contact with your surgeon via email at any time after your procedure, and of course Kristýna, our optometrist, will be available to help you with any other follow-up advice that you might need, as will our friendly English-speaking team in Prague. And of course, you’re welcome to drop into our Prague clinic again for a free check-up any time you’re back in our beautiful city.